New Almaden Quicksilver Mine was discovered in 1845 by Mexican Calvary Officer and mining engineer, Captain Andres Castillero, original grantee of Santa Cruz Island. Castillero discovered that the red rock used by the local Oholone Indians to paint, was cinnabar, an ore containing mercury. Mercury was needed to process silver in Mexican silver mines. The original mine was registered by Castillero in 1845, and is older than any gold mine in the state. It was named for the famous Almaden quicksilver mines in Spain. The mine operated over a longer period of time (1840s-1940s) and yielded metal of a greater total value than any other metal mine in California. The mine produced over 76 million pounds of quicksilver. Between 1846 and 1849 there were various transfers of shares from one owner to another. The principal participants were Alexander Forbes, Eustace Barron, William Forbes, Eustace W. Barron, Juan B. Jecker, Isidoro de la Torre, Martin la Piedra, Francisco Maria Ortez, James Forbes, Robert Walkinshaw and John Parrott, most of whom were also connected to Barron Forbes and Company of Mazatlan. By 1850 Barron Forbes and Company had acquired all of the New Almaden mine shares. Legal challenges plagued the land from the outset. The United States Supreme Court was concerned with the mine in four separate cases, and ultimately Andres Castillero lost not only the land, but also the mine. Barron Forbes and Company ran New Almaden until 1863 when the Quicksilver Mining Company assumed ownership. The mine is located in Santa Clara County, a few miles south of San José and today is owned and operated by Santa Clara County Parks & Recreation. The Quicksilver Mining Company Annual Report for 1874. Originally the New Almaden Mining Co. Incorporated by the state of New York, April 10, 1866. 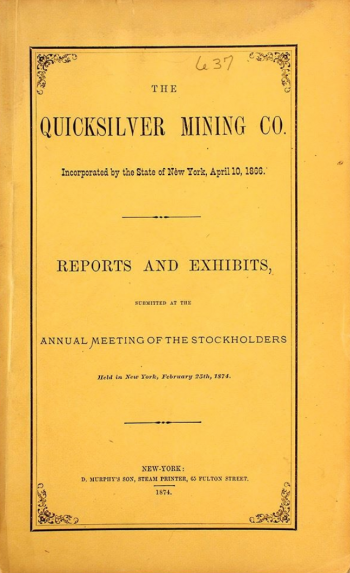 Reports and exhibits, submitted at the annual meeting of the stockholders held in New York, February 25th, 1874 by Quicksilver Mining Company. D. Murphy's Son, steam printer, NY. Original printed yellow wrappers stitched (spine is separated). 37pp. Very good. The mines were located in New Almaden, California. President Daniel Drew reports on their productivity: 11,042 flasks of mercury were produced each weighing approximately 76 pounds. Details production at each of the mines for the company. After being discovered by Indians near San Jose, CA., Andres Castillero, a captain in the Mexican Army, obtained a grant to the mine in 1846 but, occupied with his military duties during the Mexican War, soon sold it to Barron, Forbes Company, an English textile firm based in Tepic, Mexico. The original mining claim was confirmed by the Board of Commissioners that evaluated private land claims in California on January 8, 1856, but continuing litigation in the District Court, The United States vs. Andres Castillero, plagued the company. A claim of fraud was made on behalf of the Quicksilver Mining Company, which had acquired a competing land claim originating in an adjacent agricultural lot to the mine. On appeal to the U. S. Supreme Court the mining claim was found invalid in a decision rendered March 10, 1863. 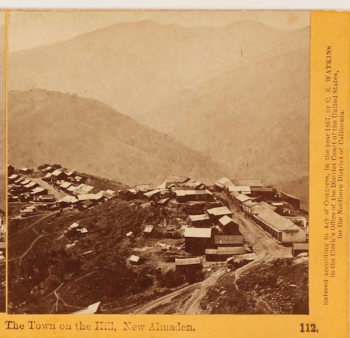 After another related claim was settled, the New Almaden Mine was re-incorporated on April 10,1866 as the Quicksilver Mining Company. » : Johnson, Kenneth M. The New Almaden Quicksilver Mine California. Talisman Press, 1963. This page was last edited on 15 March 2018, at 07:47.